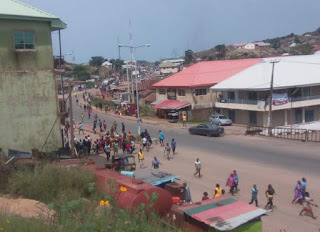 News reaching us from a reliable source is that an unidentified Muslim Keke rider conveying 3 passengers who happens to be Christians allegedly stabbed one of his passenger (a woman) multiple times to death. The source later added that the ugly incidence happened at Fatima Junction. The two other passengers who couldn't over power the Muslim Keke rider took to their heels and alerted others for help. On getting there, angry mobs allegedly from the Christian race came out in Mass and murdered the tricycle driver and burnt down his tricycle. As at the time of sharing this report, everyone is on the run.